I understand this view. I don’t want to pretend that I find it incomprehensible, or that it’s without any rational basis. The European Union is an institution weighted towards transnational capital, its decisions are made in backroom committees far from public scrutiny or understanding, and the only directly elected institution — the European Parliament — lacks the formal powers of a proper Parliament. The left-wing critiques of the European Union are not without foundation. But I am still voting to Remain, because how I vote on June 23rd is not just about expressing my opinion on the structures and nature of the European Union. My vote is not about the purely constitutional question of whether we exit or stay; it is what will happen the next day, and the next month, and the next decade. It is about the symbolism and consequences of a Brexit, and about the practical outcomes of the EU’s third-largest country leaving the trading bloc in a campaign filled with racism and fear. In short, I am voting to Remain because this referendum is bigger than my academic opinion on the EU. My vote is not about the purely constitutional question of whether we exit or stay; it is what will happen the next day, and the next Amonth, and the next decade. 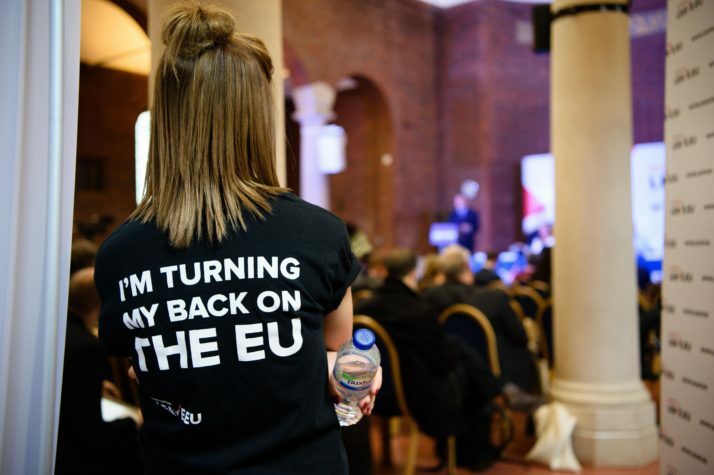 While I accept the critiques of the EU from a left-wing standpoint, I strongly criticise the suppositions and assumptions that have been floated by many in the Lexit crowd. Some have claimed that Cameron will resign, and that we’ll have a general election; others expect a crisis that will split the Tories in half; and still more contend that remaining in the EU will bind our hands if a Corbyn government is elected, or even that Britain will face a Greek-style attack. None of those things are certainties, or even likelihoods. They are hopes: hopes reliant on the actions and benevolence of Tory politicians who have spent decades scheming to win power that they will not risk losing so soon. And they remind me strongly of the ‘No to AV, Yes to PR’ campaign that was run in the 2011 voting systems referendum. Vote No to the Alternative Vote, it claimed, so that we could get ‘real reform’ a few years down the line. Five years later, we have a Conservative government elected on just 24% of the electorate, and no hope of electoral reform for a generation. The truth is, the choice we face on the ballot paper is not simply whether we remain or leave a political body. It is a vote brimming with symbolism and political consequences, which cannot be brushed away simply because it is uncomfortable for the left to acknowledge them. If Leave wins — after running a campaign awash with racism, a campaign that attacked regulations for stifling business and a campaign rife with social conservatism — then the politics of Britain will be shifted even further to the right. The U.S.-style political rhetoric — of “terrorist sympathisers”, “breaking point” and “we want our country back” — will only get worse. And the message sent to the rest of the world will be that it is politically palatable to champion isolationism, racism and xenophobia — and that solidarity and partnership has been cast aside by Britain in favour of narrow self-interest. One might call these predictions too. But they are not hopes, reliant upon the benevolence of Conservative leaders. These are my fears, and my observations; they already happening, and they will get worse if we leave. I am critical of the European Union. And if we were governed by Jeremy Corbyn, I feel confident the things we lost from EU membership — freedom of movement, workers’ protections, human rights protections, environmental regulations and a sense of international solidarity — would be re-created in a kinder, more progressive form. But while we are governed by David Cameron, or even Boris Johnson (if he succeeds in his post-Brexit ambitions) there is zero probability of these things happening. All we would get is a Conservative government that would have four years to utterly destroy the fabric of British society, unrestricted by anything. And sure, there might be a crisis: but those most harmed by a crisis, social or economic, are always the most vulnerable and the most poor. I have no desire to roll the dice. In the end, a vote to Leave will be taken as an endorsement of the Leave campaign, and regardless of the motives of each individual Leave voter, there’s no option for a “Left Leave” on the ballot paper. Every Leave vote counts the same, and when the Daily Mail reports a Brexit with glee on 24th June, they won’t add a caveat that around 10% of the Leave votes were votes for a socialist Britain. Nobody will care — nobody will remember. And while the fascist right is on the march in France, Austria, the United States and other countries across Europe, I will not vote to give succour to the right or to send a message to the rest of the world that Britain hates immigrants and hates the rest of the world. So. Lexit? Maybe one day. But the 23rd of June isn’t just about how I feel about the EU on that day. It’s about the consequences of what would happen if we Leave. Whether you, reading this, fear those consequences, I don’t know. But I do fear them. I can’t write this article on the ballot paper. I can’t write in “socialism pls”. I only have two options: leave or stay. Isolationism or internationalism. “Vote Leave” vs “Stronger In”. Neither are options I admire. But whether we’re talking Marine Le Pen vs Jacque Chirac, Bush vs Gore, Clinton vs Trump or Remain vs Leave, sometimes we have to choose a bad option to stave off an utter disaster. Politics is high stakes, and sometimes that’s the only political choice we can make. So, using the one political choice I have on June 23rd, I will choose to stay. I hope you do too.